Craig Keener and Linda Belleville write the egalitarian essays. Both provide clear biblical support for their views. Keener gives an overview of the many places in Scripture where women served in various capacities, including apostle (Junia). He also reminds us of the need to carefully distinguish between transcultural mandates (easily applied to any culture) and culture-specific ones. Belleville contributes some valuable material in her discussion of the general nature of authority in the church, showing from Scripture that “it is the church that possesses authority and not particular individuals (or positions, for that matter)” (p. 106). In pages 130-139, Belleville answers well all six questions from Wayne Grudem’s “An Open Letter to Egalitarians” (Journal for Biblical Manhood and Womanhood, March 1998: 1, 3-4). Complementarian Thomas Schreiner begins his essay by reminding us that the church has a long history of defining women’s roles in a certain way. He then proceeds to respectfully focus on the “dignity and significance of women” (pp. 183-188), followed by a section outlining many of the ways women ministered throughout Scripture. Then, explaining the difficult passages on women by building on the idea of a “creation order,” Schreiner concludes that women should not teach or exercise authority over men, choosing to explicitly apply this statement only to the pastoral office. Ann Bowman’s essay seemed inconsistent, as I read page after page of what appeared at times like egalitarian thought and at times like a general handbook for anyone entering the ministry, having little to do with the topic of the book. Her support of male authority seemed out of step with much of her argument, and her conclusion that women should not serve as senior pastors made the essay even more bewildering! An egalitarian myself, I admit the possibility of reading my own bias into this book, but I did finish disappointed. The format of the book places the egalitarian essays first, followed by the complementarian essays. The last part of the book is an appendix written by Craig Blomberg, entitled “Neither Hierarchicalist Nor Egalitarian.” The editors believe this represents a third viewpoint, one that maintains a woman may serve in any capacity except that of senior pastor. Blomberg, however, along with Schreiner and Bowman, heavily employs the idea of fundamental female subordination (a “creation order”) to support his case. This seems to fall quite naturally in line with the complementarian view. The end result is that complementarianism gets the last word, and in disproportion to the two essays written by the egalitarians. 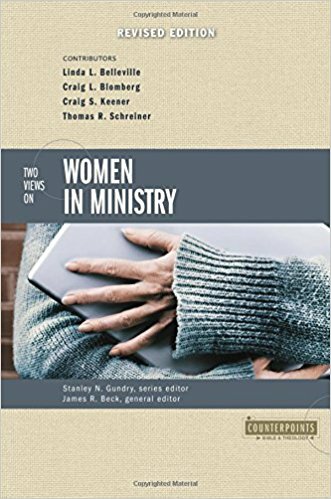 Disappointment notwithstanding, I recommend this book to those wanting a good overview of the issues involved in the current debate on women in ministry, specifically in the context of evangelicalism. Academic in its approach, it is readable enough for the average layperson; and its call for respectful dialogue between those of different viewpoints is admirable, especially to a former “fighting fundamentalist” preacher’s kid like me. Julia Bloom is CBE’s international and membership coordinator. She lives in Minneapolis with her husband, Nathan, and is a member of a racially integrated church in her neighborhood.